Just saw this on the Columbia Heights listserve. Not bad. Commonwealth has announced a Stroller Special for Lunch. Kids under 6 eat a free special lunch between 11:30 am and 4 pm Monday through Friday, and the parents enjoy a free half pint! A family can't beat that deal!! Hope you are having a good one. Looks like the city is pulling out all the stops for Black Friday, the day after Thanksgiving and the first Christmas shopping day of the year. They're expecting tons of people to shop at DCUSA, and Councilman Jim Graham emailed the Columbia Heights listserve with some of the preparations, including opening the Metro at 4 am and having street performers for the lines of people they expect. In addition, Columbia Heights ANC commissioner Anne Theisen said there will be additional police around, portable toilets, and that they expect people to camp out on Thanksgiving night. Sounds crazy. I'll be out of town, but if anyone is there to take pictures, please let me know! Way to go! Apparently the robbery suspect from the email drive was freed again. Oops! DC Attorney General Peter Nickles (or is it Nickels?) tells the City Paper that it was the US Marshalls' fault this time. Awesome. A U.S. attorney's office spokesperson said they weren't going to charge the kid anyway, but that DC's attorney general's office could have pursued it, and he shouldn't have been released. Apparently the kid had just turned 18 and had been ruled mentally retarded previously. Nickles also told Loose Lips that he wasn't as angry at the email flood he received: "'Some were generated where the same words were used,' he says, but 'many were personal, from persons who had been robbed, persons who had been mugged.'" Thanks, Pete. The Post has a piece on it also. Beer and wine at Target! Finally. I've been writing about this since April, and after many "next months" they finally got it. I noticed it on Saturday, they have a good selection of wine and a fair amount of beer. The wine didn't seem too pricey, but the beer was - $9 for Corona, for example. Still, nice to see. Maybe they'll drop prices. And I didn't see the famous Target Wine Cube, but maybe I just missed it. I first saw this on MPD's Third District Substation listserve, they've arrested the same teenage suspect three times for a string of 21 robberies, only to have him released and commit more robberies. Inspector Edward Delgado posted the message to the listserve, asking constituents to write DC Attorney General Peter Nickels and demand that the suspect not be released again. He hasn't, but the Post reports that Nickels wasn't happy about it and wasn't reading the emails. Apparently the suspect had been coming up behind people, knocking them over, and taking whatever he could. According to Delgado, the suspect was a juvenile and was arrested the first time after committing 6 robberies. He was then "released from jail because he was found to be incompetent to stand trial." After that he committed 6 more and was placed in a halfway house, which he ran away from, and committed more. Pretty interesting story, and I hope that this solves this particular problem. Progress on the Haunted Mansion? Looks like they're finally doing some work on what I call the Haunted Mansion, the really crummy looking house on Girard Street between 13th and 14th. I've written about the place before, it's owned by Dorothy Brizill and Gary Imhoff, two well-known political activists. 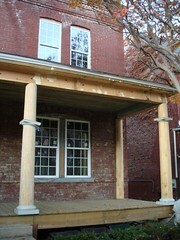 It looks like they put in new windows on the first floor as well as new columns. The highest floors still have some broken windows and general creepiness, but it looks like they're trying, at least. Columbia Heights hurting Mount Pleasant? I saw this today in the Post and was surprised - there's an article about Mount Pleasant's struggling commercial strip. I read it and thought "what? It's struggling?" The gist of the article, by Paul Schwartzman, is that Mt. 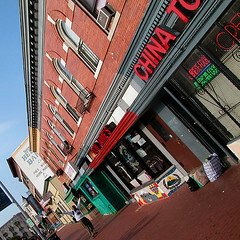 Pleasant Street is down recently, thanks in part to the bad economy, DCUSA and other development in Columbia Heights. But I don't really think it's down. In the 8 years or so I've been going there, it seems like there's about the same number of businesses. He talks about vacant storefronts, but when I was up there on Sunday getting some breakfast at Dos Gringo's, I didn't notice any. As evidence, he cites the palm reader, laundromat, computer center and two food markets as leaving. To me, a palm reader and computer centers really aren't that viable as businesses. The palm reader is quirky, but it's not like I go around looking to get my palms read. Maybe I have a different viewpoint than people who would go to a palm reader, but that's hardly something I'd miss. And what's a computer center? I don't know. Plus I can think of two other laundromats on that street, and as he notes later in the article, another is opening in January. Sean Flynn, 38, a neighborhood homeowner who teaches law at American University, said the strip has long been dominated by "two kinds of establishments -- laundromats and mom-and-pop groceries that sell to" Latinos. "I love those things, but I don't need 10 of them," he said. "We've always wanted more diversity in the retail. So, frankly, when some businesses close, we're happy." Flynn goes on to say that he'd like a "'really cool, vibey restaurant/bar' or a market that sells cheese, meats and wine." But you could argue that Mt. Pleasant already has the former in a few places, like Tonic, Marx Cafe, Radius, The Raven, etc. Another local wishes there were a McDonald's because "it provides a social structure. It's a way to bring people together." What? Does that mean I support the gentrification of Mt. Pleasant? Of course not. I like its quirky variety, from coffee and breakfast spots like Dos Gringos to kooky dollar stores to dive bars (The Raven) and regular bar/restaurants (Tonic). There's El West, the Latino-focused western store, Asian food, Latin American food, pizza, hardware, and a great bakery (Heller's). I think it's doing well. Is it just me? Photo by Mike McCaffrey, used under Creative Commons. 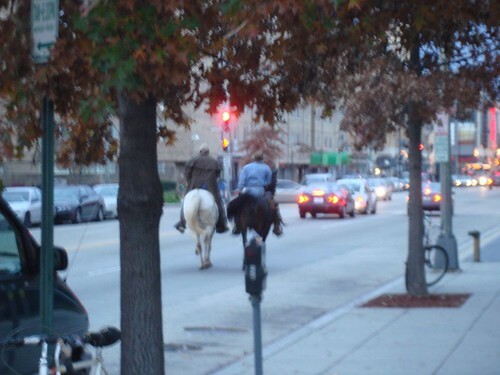 I snapped this photo on Saturday, two guys dressed like cowboys were trotting up 14th Street near Girard. I've seen police walk around, but these guys weren't in uniform - they even had cowboy hats. Sorry it's blurry, but it took me awhile to get my camera out. Weird. I found this Post letter to the editor the other day, it talks about the city's regulations for parking in new buildings - generally, there are too many spaces required. The writer uses DC USA and the Columbia Heights Giant as an example, with the project's garage frequently mostly empty. Kind of an interesting point, though maybe traffic will increase around Christmas and when Ellwood Thompson's comes in. The writer notes that some sports should be converted to bike parking, which is a good idea -- bike parking is often very full around DC USA. As mentioned in the previous post, I went to the new Panda Express on Irving Street near 14th last night. The verdict: decent. It's basically fast food Chinese -- there's a buffet type thing and you choose various entrees and sides and they scoop it into your plate (or take-out box). 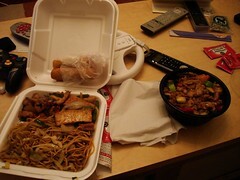 I had the Thai cashew chicken and string bean tofu with chow mein, and my buddy had the Kung Pao chicken. Most of it was ok - the Thai chicken wasn't very Thai or cashew tasting, and the string bean tofu was bland, while the chow mein was pretty good. My buddy said the Kung Pao was decent. I also had the spring rolls, which were kind of mushy. In short, not the place to take a date, but decent if you want something quick after work. 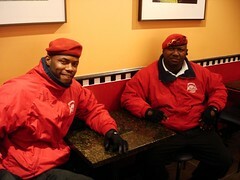 I was at Panda Express (review coming) and saw these two Guardian Angels. They were pretty friendly and told me they were doing a patrol tonight (Tuesday) at 14th and Otis, near where a shooting was the other day. The Columbia Heights listserve has more, with the group patrolling the northern Columbia Heights/Petworth boundary area -- "14th Street , 16th Street , Center Street , Hertford Place , Meridian Place, Oak Street , Ogden Street, Otis Place , Parkwood Place , Perry Place , Spring Place, and Spring Road" from 7 to 9 pm according to the post. Anybody see them on patrol? Starting this Wednesday morning the track at Cardozo H.S. will be available to use. The track will be open M-F, 6.30am-8.45am and 4pm to dusk. Caracara is a multifaceted term. “Face face” (Spanish), “from from” (Japanese), a type of orange, and a bird of carrion - the term unites stutterers, fruit fans, and bird watchers alike. It’s also indie rock outfit Caracara, a band with an amalgam of many sounds (like its name). Mt. Pleasanter Jeremy Borrego moved to the Columbia Heights area two years ago with indie rock ambitions, finally realized after pulling in bassist Isaac Weiser, drummer Rob Rifkin, and lead guitarist Izzy Miller. They’ve quickly established themselves in the neighborhood music scene, winning the hearts of rock fans (with shows at Dahlak and The Red and The Black), frat boys (first band to ever play at Adams Mill) and biker bad-asses (at a car show in Manassas). Jeremy Borrego talks with us. How did you all come up with the band name? The band name was actually my stage name from my last band, Man Eagle. In that band everyone had a bird name and since I'm Mexican I was the Caracara. We liked it though for this band because it is so ambiguous. I moved here after college and needed a musical project. I put up a Craigslist ad and responded to a bunch of ads myself. Eventually I found some sassy dudes with similar enough tastes to start making music…and now we have a demo. Do you play any gigs in CH? A lot of older country-blues stuff like the Stones and Zeppelin, more modern Indie stuff like the Arcade Fire and early Modest Mouse with a fair amount of darker fare like the Mars Volta and the Kings of Leon. What’s your take on the local music scene? Mt. Pleasant has these really cool, underground shows at La Casa from time to time and I've seen some great acts there…like the Apes and Ra Ra Rasputin. There's so much good music floating around DC, I just wish there were more of a central stage for it all. Dahlak's is kind of trying to do that and there are a bunch of cool open mics around, but I wish more venues were open to local bands. There's already a rapper named Sticky Fingers and the glory of the Wonderland Ballroom cannot be surpassed, so I'd have to go with the Red Derby. It's a great name, I love that bar's vibe, and sometimes you need a beer in a can! I saw this yesterday on the door, the Bank of America branch at 14th and Irving Street NW (right on the corner) will be opening Nov. 14, as well as the ATMs. I wonder if they'll be removing some of the other nearby BoA ATMs? The one next to the CVS seems to be broken half the time anyway. 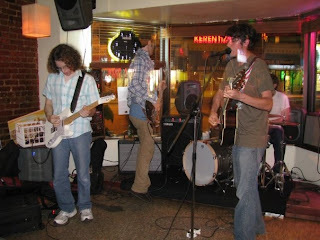 Former Band in the Neighborhood Petworth is playing tonight at a party at 752 Columbia Road NW. It's a vegan, straight-edge house, so that means no booze or bacon. And they're also doing a stuff exchange. Might be a good time. Also happening tonight, DJ Haaps is playing at Wonderland, which has a full schedule of music this weekend - DJ Meistro will be there Saturday, and Michael Jantz on Sunday. The DC Board of Elections and Ethics has posted the results, it looks like Ward One voted with the winners in most cases. Neighborhood listserve character William Jordan won his ANC race, as did South Columbia Heights Neighborhood Association president Sedrick Muhammad. Dee Hunter, also a candidate for at-large city council, lost her his ANC race, while most others were a landslide. You can also break down the results by precinct to get more detailed results. I was out on U Street when the celebration began - people everywhere, in the streets, on bus stops, hugging each other, giving high fives, etc. It was the biggest happy crowd I've ever seen. I've heard the area around the Columbia Heights Metro was crazy too, anybody have experiences from there? I voted at the Latin American Youth Center at 1419 Columbia Rd NW today at about 10:30 am. The line was pretty long, at least half way to 15th Street, but I got in quickly thanks to having a last name from U-Z. I passed probably a few hundred people on the sidewalk and snaking into the building. When I was done, the voting machines I saw totaled about 800 votes. There may have been others I didn't see though, plus the touch screen. One weird thing was that a man tried to vote write-in on the touch screen machine, but couldn't figure it out. The voting staff told him he couldn't do write-in on the touch screen, and would have to start over with a paper ballot. However, on page 5 of the DC Voter Guide, it specifically says you can vote write-in on the touchscreen - it says "to vote for a candidate not listed, touch 'write-in' and a keyboard will appear." So that's odd. Folks outside were selling coffee and donuts to benefit the center, and the line continued a long ways into the building. In total, I finished in about 30 minutes. What were your experiences voting? Looks like there are some water outages around the neighborhood and elsewhere. WASA reports a water main break at 12th and O, and DCist has a map of locations, including 13th and Florida. Anyone else having problems? Where at? 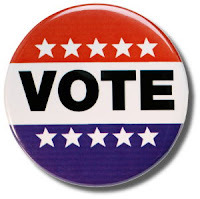 I try not to be political, but there are a lot of local elections up on Tuesday. Here's my picks. At Large DC Council - you can vote for two, and I endorse Kwame Brown and Patrick Mara. Kwame has been a councilmember for a few years now and has a done a good job - he's responsive, accessible, and logical. Patrick Mara is a newcomer, but I prefer him over the other two frontrunners, Carol Schwartz (write-in) and Michael Brown. Schwartz has fought against the mayor's school reform, which is why she lost the Republican primary to Mara. And Michael Brown is endorsed by Marion Barry, which is reason enough for me not to support him. Shadow Senator - The shadow positions serve to advocate for DC voting rights. Paul Strauss recently got arrested for a DUI, but I think he'll continue to do a good job. He's been shadow senator for 12 years and knows how to make a fuss. Shadow Rep - Mike Panetta is also great at making a fuss and getting press coverage for DC voting rights. He's gotten a lot of coverage recetly for creating the DC Olympic Team and other events. Ward 1 State Education Board - Dotti Love Wade is a capable and dedicated Advisory Neighborhood Commissioner and served as the ANC chair, so I'm supporting her. ANC commission - this one is hard since there are so many. I recommend voting against the incumbent unless you know who they are. If you don't know who your commissioner is, then they're probably not doing a good job. President - Barack Obama, not like it matters in DC. Obama supports a voting rep for DC, McCain does not. If you want to help Obama, do some phonebanking! 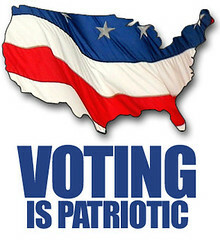 But whatever you do, go vote, and encourage your friends to do the same! Here's the full voter guide from the city, and their website.